April Tax-Relief Special! 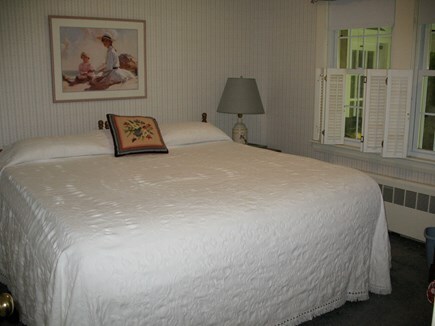 $200 off ($1995 plus tax) per week for July and August rentals! Relax! 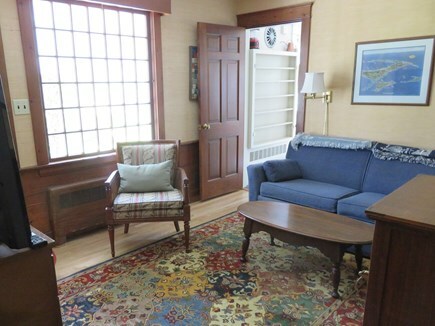 Ocean breezes caress this lovely Cape Cod home, located just off the entrance to Falmouth Harbor. Listen to ferries whistle as they carry vacationers to and from Martha's Vineyard, just a 35 minute boat ride away. Start the day with breakfast in the sunlit dining room and watch the masts of sailboats as they exit the harbor. The house is arranged perfectly for a family, with two bedrooms (king, double) on the first floor, and another double on the second, along with a dorm area (4 twin beds) for the kids. Enjoy a short walk to Falmouth's quaint Main Street through tree-lined neighborhoods, and sample the eclectic fare at some of the area's best restaurants. 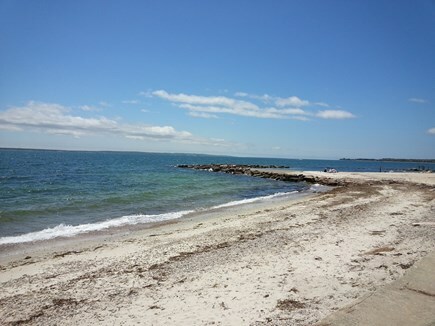 Swim at Falmouth's wonderful nearby beaches such as Falmouth Heights or Surf Drive. Bike along the Shining Sea Bikeway, through salt ponds, along the shore, and into Woods Hole. 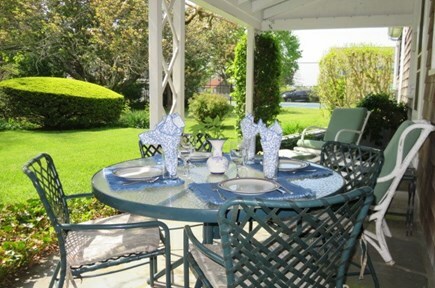 Or stay close to your home-away-from home and catch some rays in the sunny and private back yard, or enjoy a book on the wisteria-shaded patio. 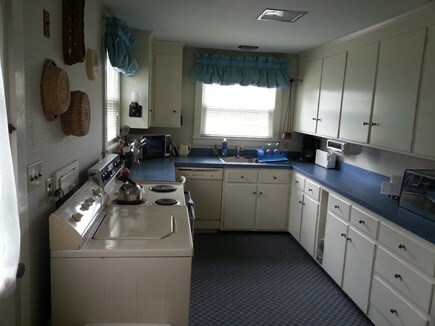 The gas grill is perfect for a family cookout, and the washer and dryer provide the convenience of home. This true Cape Cod-style home is nestled in a quiet neighborhood and is a perfect base for either an active stay, a lazy and restorative old-fashioned summer vacation, or a little of both! The yard and surrounding roads are lush with greenery and flowers. Walking and biking are great ways to see the area - and there is so much that is nearby. 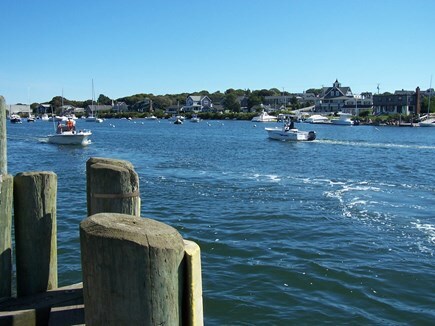 The Shining Sea Bikeway wends its way 3 miles past Falmouth's beaches, cottages, and ponds. Whether you're a nature buff or shopper, you can find things to do within a mile of the house. Fishing boats, ferries, and scenic sails depart from the harbor daily. There are exclusive shops on Main Street, and the Falmouth Commodore baseball team plays 2-3x per week in summer. The family-friendly Surf Drive beach is within walking distance and children will enjoy exploring the tidal pools for a variety of sea life and beautiful shells; many other beaches are a short drive or bike ride away. After biking or the beach, a great place to have a casual meal is at the Clam Shack; it's at the end of the street and has picnic seating right on the water - a perfect spot to watch the boats come and go! We've tried to equip the house with lots of rainy day ideas and activities. There are two TV's with cable, but we also have many games and puzzles that will keep a wide range of ages occupied. A rainy day is also the perfect time to take advantage of the wonderful shops and bookstores on Main Street - a great place to go souvenir hunting or to find the next vacation book. Woods Hole offers an interactive aquarium. In nearby Mashpee, there are movie theaters, a kids' craft center, more shops, and restaurants. 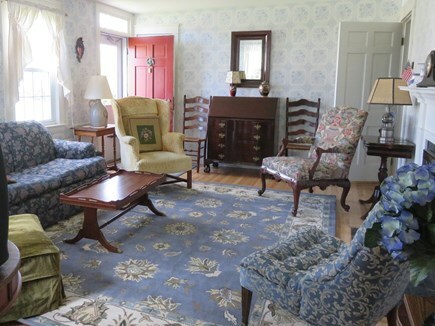 Additional pricing info: Rental price does not include 5.7% Massachusetts state tax. All other fees included. State and local taxes of 12.45% will apply. What a wonderful time we all had! We had family flying in from overseas and chose this wonderful cottage as our home for the week. Jane was great to work with, and the house was lovely. Peaceful garden and great location next to the harbor. The beach and town are but about 10 -15 minutes away. Great place to be and we had everything we needed! Highly recommend this home. We started planning our next trip back on the way home. 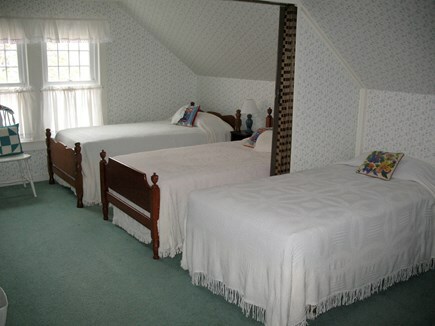 My husband, mother-in-law, and two young children had a wonderful stay at this beautiful Cape Cod cottage. The house was clean and comfortable. It was conveniently located to a nice public beach and Main Street in Falmouth. My daughters loved playing in the backyard which was spacious and beautifully landscaped. 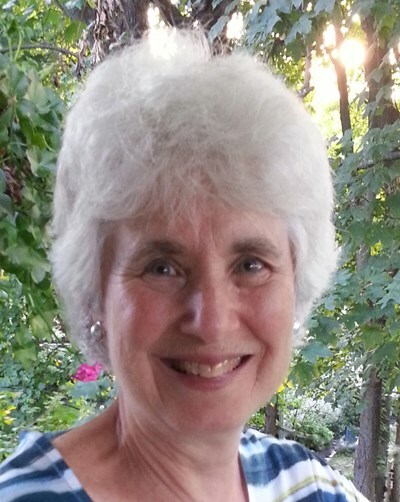 Jane, the owner, was very responsive and a pleasure to work with. We would most definitely return! Wish the house was mine. 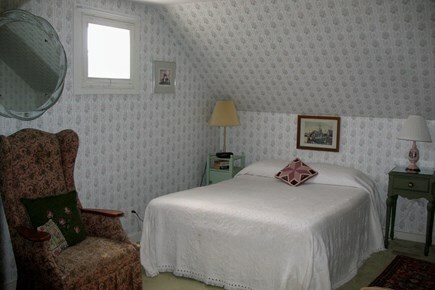 Your description of your charming, authentic Cape house was right on the mark. It was a perfect vacation for our 1st annual Regan get together. You had all the amenities and more. It was truly a cozy, charming house with so much yard space and extra beds! And it was great that we were right in the middle of a walk away from downtown, bike trails & the beach. Perfect vacation!! Thank you for your amazing hospitality! 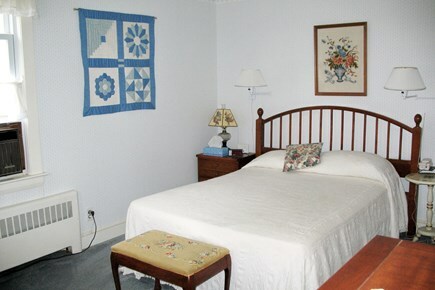 We could not be happier with our stay at Swing Lane in Falmouth. The house is adorable, we enjoyed many meals on the awesome back patio. Jane was so helpful. I have severe fragrance allergies and she went out of her way to make sure the house was not cleaned with products that bothered me. Would absolutely recommend this property! 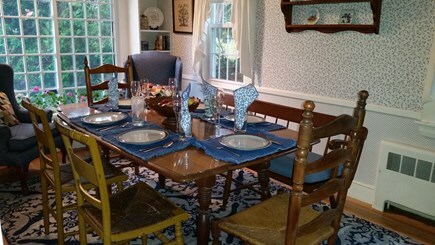 We've been using HomeAway for years now, and we LOVED this rental! Quiet, walkable street AND neighborhood. Boat tours and much more in easy walking distance. Shopping in easy walking distance. Good division of space (we rarely saw the teenagers, and they liked having their own space). Also enjoyed sitting in the back yard watching the rabbits frolic. All in all, we recommend this rental, and we'd do it again. My grandparents purchased the cottage in 1963 when I was a child. We spent family vacations there for years, and still do with our own children and extended family. There are lots of special memories: 4th of July Fireworks over the harbor, Falmouth Road Race runners speeding past the end of the street, playing croquet in the yard, bringing a picnic to the Thursday Night Summer Band Concerts on the marina, wandering down Main Street for an ice cream on a hot night, biking on the Shining Sea Bikeway to beaches, and spending special times in the off-season (May and October are especially lovely!). Because it is a treasured family home, we hope that our guests enjoy the love and care that we put into maintaining it and insuring that they have a good vacation. Come and make your own memories! One of my favorite spots is the patio. 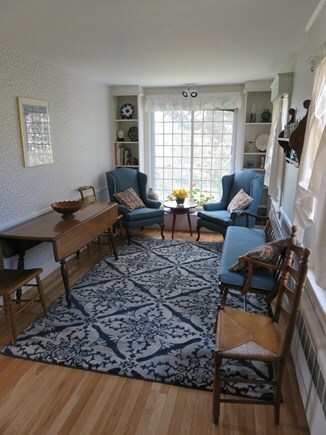 Whether we are gathering for meals, or games, or just reading, it's a cool and quiet place to relax. Birdsong and bunnies are plentiful! Also, there is really no need for a car; the beach, the harbor (and ferries), Main Street, Falmouth's Cape Cod Baseball League team, and a grocery store are all within easy reach on foot.